The first singular Japanese Card of the Day in a while. Cont (RC) GB2 Brave: During your turn, your other front row Units all gain Power+3000! Auto: When this card is placed on (RC) due to a card effect, if you have an “Altmile” Vanguard, during that turn, this Unit gains Power+3000, and if there’s a face-up card in your G Zone, you can choose 1 card from your hand, and discard it. During that turn, this Unit gains [Boost]. For Today’s Card, we’re introducing from the Character Booster “TRY3 NEXT” (on sale December 9th, 2016), the Grade 2 Unit “Knight of Ambuscade, Redon” which has the 《Royal Paladin》 【Brave】 ability. 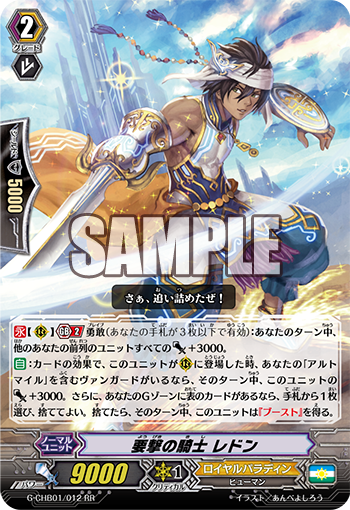 “Knight of Ambuscade, Redon”, which appeared in the animated series, is a key Unit for 《Royal Paladin》 Brave Decks. When this card is placed on the field due to a card effect, and an “Altmile” is your Vanguard, it gains Power+3000. And if there’s a face-up card in your G Zone,, you can discard 1 card from your hand to have it gain the Boost ability. So am to activate its effect by Superior Calling it with cards like “Knight of Heavenly Decree, Altmile” or “Holy Dragon, Brave Lancer Dragon”. Also if you’ve achieved Generation Break 2 and 【Brave】, all of your front row Units other than itself gain Power+3000! If it boost from your Back Grow, your Front Row gain Power+3000, making it capable of being a powerful support card. So let’s apply incredible pressure on your opponent with overwhelming power. The Character Booster “TRY3 NEXT” contains many cards that support Brave Decks. So let’s pay attention to future information!